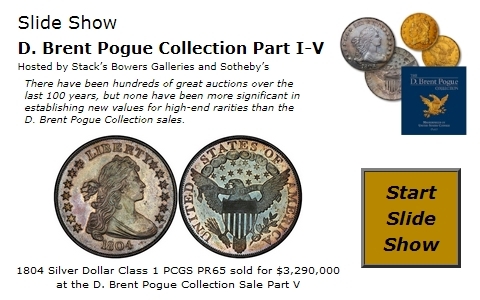 �����The FUN Show attracted thousands of dealers and collectors this past week, but it was the Heritage Auctions FUN Sale that rocked the coin market. There were seven lots that brought over $1,000,000 each with another three that realized at least $800,000. With this many million dollar coins it is quite difficult to pick a single highlight of the sale. �����The 1793 Chain Cent, America, Periods in PCGS MS66 Brown with the CAC sticker commanded $2,350,000. It has been off the market since its last sale in 1992, but it was also its first appearance in an auction since 1890. It has changed hands several times throughout the years and was a major part of the famous collections of Parmelee, Brand, and Naftzger. �����There were over ten Continental Dollars that sold for over $100,000 each with two different lots bringing $1,527,500. The first was the 1776 Continental Dollar, CURENCY, Silver in NGC XF40 and the second was the 1776 Continental Dollar, CURRENCY, Silver in NGC MS62. These are extremely rare as they represent two of only four known minted in Silver. These coins were part of the Patrick Collection Part I which realized an overwhelming $25.93 million. �����The top seller in the Patrick Collection was the 1792 Birch Cent in NGC MS65* RB which also had the CAC sticker. This lot brought $2,585,000 and is definitely the finest known. Below we have listed some of the many other highlights from this Heritage Auctions FUN Sale. For a complete list of prices realized including the Patrick Collection, please contact Heritage Auctions. �����With Gold progressing over the $1,220 mark last week, the Moderns Wholesale Market Dealer Price Guide is covered with advances in Eagles and other bullion related charts. Gold Eagles in MS69 are at $1,255 wholesale and maybe even a little more today with Gold up to $1,230 this morning. Dealers are hopeful that metals will continue to improve because it creates a more positive overall coin market.